Ever wish you could see photos of your favorite bands and musicians while listening to their music? Electric Pocket Limited has launched Coverjam Pro, an app to do just that. Released on Tuesday for iOS, Coverjam Pro visualizes the music-listening experience by playing a slideshow of images tagged with an artist’s name, as their music plays. Specifically, the app searches through and retrieves images from photo-sharing services Instagram and Flickr. Users can select the songs, albums, or playlists for which they want images and Coverjam Pro does the work of fetching and compiling the photos. The app is also compatible with the default iOS iPod player, so you can launch Coverjam Pro without interrupting your songs. For those who tend to play their music on repeat, Coverjam Pro ensures that, unlike your playlist, no artist’s slideshow is ever the same. So if you’re listening to that Simon and Garfunkel song yet again, you’ll get a different set of photos of the duo. Users might also encounter some surprises in the slideshow. For instance, while listening to Bob Dylan, you might come across a snapshot of a dog named after him. 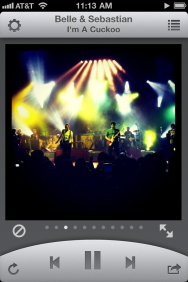 Other Coverjam Pro features include photo sharing through Facebook, Twitter, and email; the ability to select music from either the iPod player or through the app itself; and photo viewing in Safari, where users can learn more about where a photo came from and see other photos taken by the same person. The app is available in both a paid, ad-free version for $1 and a free, advertising-based version; each requires iOS 4.1 or later.